July 4th Weekend Special Offers! To all our friends and Guild members in the United States the Foundation wishes you a happy July 4th! And to all our friends and Guild members in Canada the Foundation wishes you a happy Canada Day! To coincide with the July 4th weekend the Foundation is happy to announce several special offers. More than 51,000 new records for Catholic Parishes released! We are pleased to announce that we have added over 51,000 new birth, marriage and burial records to our website! To celebrate the release of these new records, we are also extending our 50% Off Sale until 14th February 2016! We are pleased to announce that we have added seven new Guild Member Databases of over 3000 names to our Website! With new resources now available for researching Irish ancestors, using the Foundation’s own databases can help you make best use of online records and save you a considerable amount of time. 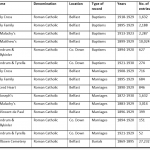 New Roman Catholic Baptismal Records At Our Website! We are pleased to announce the addition of almost 9,000 new Roman Catholic baptismal records to our website! 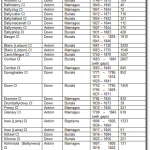 We are pleased to announce the addition to our Online Databases of over 27,000 new Church of Ireland records for Counties Antrim and Down! The Ulster Genealogical & Historical Guild was established in 1978 to provide a forum for the Irish and Scots-Irish community worldwide. Membership of our Guild begins at just £33 per year. To help Guild members and pay-as-you-go-users make best use of our online birth, marriage and death records, we have updated the online records list for County Antrim. Guild members can check out our latest additions to the Members Area as we have started to digitise audio recordings from some of our past conferences. Our ‘Voices From The Past’ lecture series should prove to be a great resource for those interested in genealogy and history.